Sorry! Registration is full for this retreat. Calling all wild women! Does your heart shout a big “Yes!” to hiking in Canada’s wilderness, canoeing along historic, breathtaking waterways, and diving into a creative and transformative week of movement and fitness? Can you see yourself staying in a comfortable wilderness lodge, with plenty of time to relax, amble along the beach, and gather around a fire at night? Then do we have an adventure for you! VOYAGE is a retreat for women who desire to explore the primal, emotional, creative connection between body, spirit, and nature in a setting of astounding beauty. 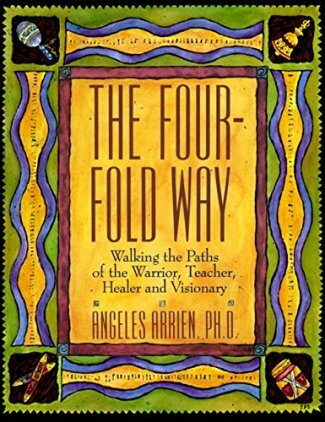 Inspired by the work of Angeles Arrien Ph.D. in her book “The Four-Fold Way: Walking the Paths of the Warrior, Teacher, Healer, and Visionary,” we will use music, dance, voice, art, hiking, and canoeing to discover the Visionary in each of us, to open to our personal and collective creative spirit. When we express the inner Visionary, we know and communicate our creative purpose and life dream. We anticipate a joyful and energizing week of unleashing this archetypal power! REGISTRATION IS LIMITED! There are only 12 spots available for this Voyage! Due to space considerations at the lodge and its facilities, we only have 12 available spaces for participants. If you are interested in voyaging with us and/or would like more information, please fill out the registration form below and we will contact you shortly thereafter. Don’t miss out on this revitalizing experience! Fees are for an all-inclusive week at Rock Island Lodge, all meals and accommodations, all Nia classes, Nia FreeDance workshops, hikes, outings, and half day voyageur canoe trip. Extra activities (paddle board or kayaking lessons/rentals, etc) and travel expenses not included. NIA FREEDANCE: a unique, step-by-step movement process designed to break through habit, tap into emotional power, stimulate creativity, and integrate the body, mind, emotions and spirit. Over six morning sessions we’ll use an evocative range of eclectic music, expertly guided movement exercises, and group sharing to elicit, explore, and expand your creative, visionary abilities. This will culminate in a nighttime fire dance on one of the final evenings. Nia classes will also be offered on most days. You can find more information on Nia at www.nianow.com. 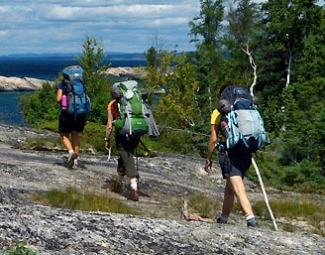 THE HIKES: Guided by Ontario certified hike leader and Nia White Belt Cheryl Soderlund, we’ll explore the rocky shorelines, white sand beaches, and trails along Michipicoten Harbour on Lake Superior. Born nearby in Wawa, Cheryl will blend her intimate knowledge of the area and great love of nature with her hike leader expertise to create a daily mindful hiking experience which will attune you to nature in new ways. VOYAGEUR CANOEING: Instructed and lead by the expert guides at Naturally Superior Adventures, we’ll learn some of the history of the French Voyageurs, the First Nations, and their beautiful land and water. Participants will receive water safety and how-to skills, culminating in paddling replica 36-foot Voyageur canoes together on a half-day adventure up the wild coast of Lake Superior. TRAVEL: Michipicoten Harbour, ON on Lake Superior is about an 11 hour drive from Toronto ON, or a 1¼ hour flight to Sault St. Marie, where a shuttle from the Lodge meets your flight for the remaining 2½ hour leg. Round trip flights from Toronto run about $250. Carpooling arrangements, and more information about flights are through Cheryl. FITNESS REQUIREMENTS/WHAT TO BRING: An average level of fitness will see you through most of the activities offered during this adventure, all of which are done at your own level, and optional. Please take your health requirements into consideration in booking this trip. Contact Cheryl or Anna with any particular concerns. A week’s worth of layers for very changeable temperatures, including a rain jacket, hat, hiking boots or sturdy shoes, bathing suit, and an array of comfortable clothing for dancing indoors and out will see you through. Toiletries, sun screen, and insect repellant are must-haves. A complete packing list will be provided upon registration. ABOUT CHERYL: Cheryl was born in Wawa, and grew up in the active, rural environment of the Lake Superior shoreline. After a long, philanthropic career promoting education, health care, and the arts, she is now pursuing her passions of hiking, cycling, travelling, and more. A longtime Nia student, Cheryl recently completed her White Belt intensive. She is also an Ontario certified hike leader, introducing groups to the joys of hiking in the Greater Toronto area, where she lives with her partner, Gord. She looks forward to introducing you to the natural beauty of wild Ontario. ABOUT ANNA: Teaching Nia since 2000, Anna, a Black Belt for thirteen years now, has inspired and mentored many on their own Nia and fitness journeys. She has produced events in Toronto for Debbie Rosas and Carlos-AyaRosas, the creators of Nia, and has offered her own classes and workshops in Canada, the U.S. , and Israel. With decades of experience in dance, Nia, and fitness, group facilitation, and the exploration of the inner landscape, she is delighted to invite you on this Voyage. Anna lives and teaches in a house in the woods in the Greater Toronto area. Each retreat in this series will improve your body awareness and physical conditioning; give you an introduction to one of the Nia movement forms; deepen your self-awareness; and provide fun, inspiring opportunities for connection, relaxation, and recreation in your busy life. If you are interested in personal growth, movement and fitness, the community of women, creativity, or exploring the Body’s Way through Nia, these retreats may be for you. If you are a Nia student or teacher, they certainly are! Combining elements from The Four-Fold Way: Walking the Paths of the Warrior, Teacher, Healer, and Visionary by Angeles Arrien, Ph.D. with the Movement Forms of Nia (Tai Chi, Tae Kwon Do, Aikido for the Warrior; Jazz, Modern Dance, Duncan Dance for the Teacher; Feldenkrais, Yoga, and Alexander Technique for the Healer; Nia FreeDance for the Visionary), and a range of creative activities, the retreats offer an immersive, movement-oriented exploration of these four archetypes. The weekend, or week-long retreats will consist of Nia movement; workshops with master teachers in martial arts, dance, and healing arts, as well as other practices such as woodcraft, archery, canoeing, painting, writing, and drumming; creative practices and interactive exercises designed to elicit and enhance your personal expression; and always, ample time to reflect, relax, and form connections with a group of friends, old and new.